With nearly 39,000 licensed practical nurses (LPNs) working in Ohio, this profession is a thriving subset of the state’s nursing industry. In fact, Ohio boasts the fifth largest employment of licensed practical nurses in the nation, with LPNs accounting for more than seven of every 1,000 jobs in the state. These professionals work in facilities like hospitals, nursing homes and doctors’ offices, where they provide the high quality patient care that is expected from the nursing community. This page explores potential educational and career paths of LPNs in Ohio, including licensure information and salary outlook. Those want to study practical nursing in Ohio can choose between certificate and diploma programs or associate degree options offered through technical and community colleges. Using the search tool below, prospective LPN students can find the school that best meets their needs based on location, school size, and cost. Like other types of nurses, Ohio requires that LPNs earn licenses in order to practice in the state. LPNs must meet requirements set forth by the Ohio Board of Nursing to obtain their licensure. Learn about eligibility, education and additional licensure requirements here. Complete the Application for Licensure by Examination to Practice Nursing in Ohio. Send it to the nursing board. In order to obtain a license in Ohio, LPNs must complete a degree program that has been approved by the Board. Those who graduated from schools outside of Ohio must provide proof that they completed coursework in IV therapy and medication administration. Pay the required $75 non-refundable application fee. Make the check payable to "Treasurer, State of Ohio." Arrange to have the director of their nursing program send a completion letter directly to the Board. Alternately, applicants who graduated from schools outside of the state should have their official transcripts sent. Register for and pass the NCLEX-PN. 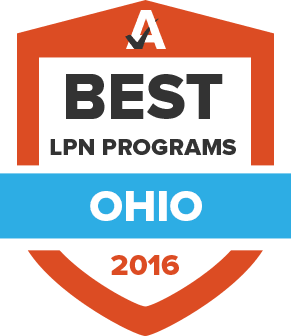 In order to continue working in Ohio, LPNs must have their licenses renewed every two years. They must complete 24 hours of continuing education, which includes a one-hour course on the law and rules of nursing practice. Like other areas of nursing, the salaries that licensed practical nurses command depends on where they live and work in Ohio. This section gives a glimpse of how much these professionals can make in different locations around the state. LPNs can work in a variety of health care settings, such as hospitals, assisted living facilities, physicians’ offices, and hospices. In addition, they may also specialize in various practice areas, which allows them to work with patients from pediatrics to geriatrics. Statistics about LPN employment can be found in this section. Outlines what continuing education courses Ohio LPNs are expected to take to keep their license current. Members of the Licensed Practical Nurse Association of Ohio, or LPNAO, can get news about the industry, participate in professional networking events, and take continuing education courses at a reduced price. In addition, the association organizes a student convention for those who are training to enter the field. Includes detailed information about the licensure process in Ohio, including license verification, renewal, and the multi-state nurse license compact. Compiled by the Ohio Board of Nursing, this page includes information on what is expected of LPNs in the state, including decision making guidelines and scope of practice. This page includes the workforce data for LPNs, RNs, and APRNs around Ohio, including employment projections. The Ohio Board of Nursing is the state body that is responsible for issuing licenses to LPNs and ensuring that education programs maintain high standards. The agency also takes complaints against nurses who do not follow the state’s professional standards. Includes nursing salary information compiled by the Ohio Department of Job and Family Services. This organization provides advocacy support, education, and professional events for nurses in the state. This page includes issues of Momentum Magazine, the quarterly magazine published by the Board that includes state nursing trends.